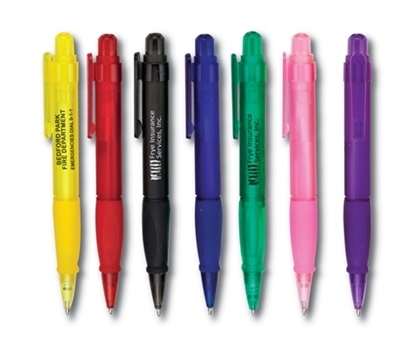 The US 2 Pen has single color printing in an assortment of colors. White barrel with color caps. Fluorescent barrel with black caps. The Preston D Pen has single color printing in an assortment of colors. White barrel with color clip and accents. 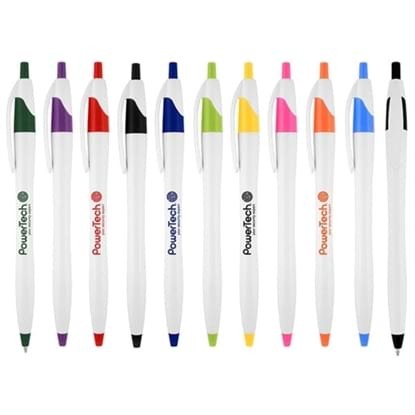 The Preston W Pen has single color printing in an assortment of colors. White barrel with color clip and accents. 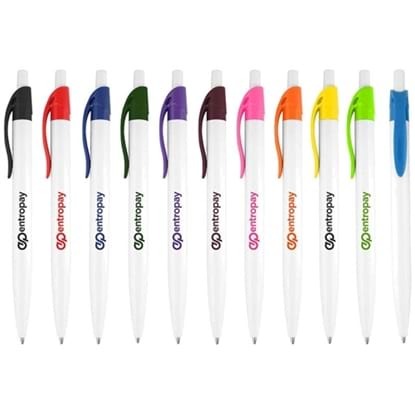 The Orlando Pen has single color printing in an assortment of colors. 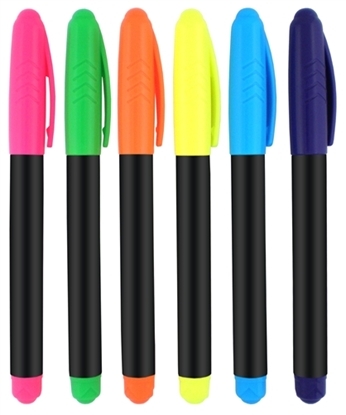 Pens come in over 58 color combinations. 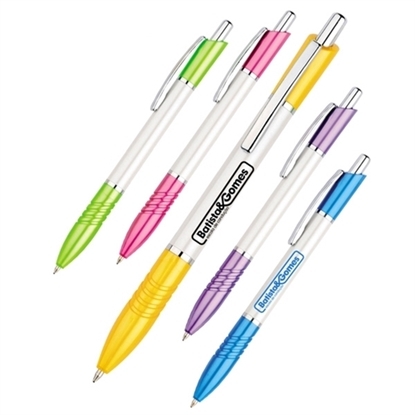 The Preston C Pen has single color printing in an assortment of colors. Clear barrel with color clip and accents. 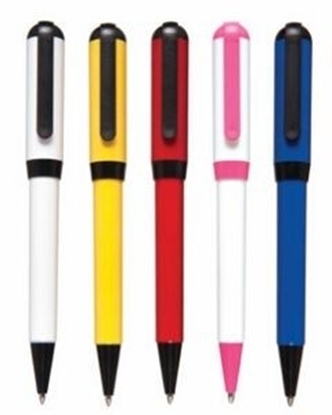 The US 5 Pen has single color printing in an assortment of colors. White barrel with color clip and tip. Fluorescent barrel with black clip and tip. 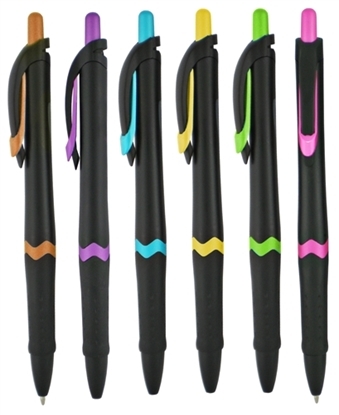 The Jet Stream Pen has single color printing in an assortment of colors. White barrel with color highlights. 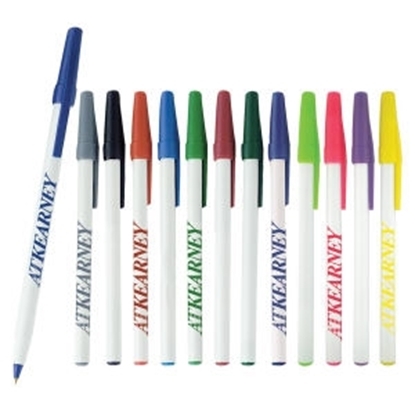 The Asbury Pen has single color printing in an assortment of colors. White barrel with color clips and accents. 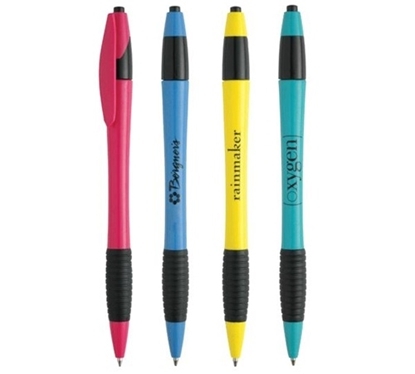 The Pacer Pen has single color printing in an assortment of colors. White accents and black rubber grip. 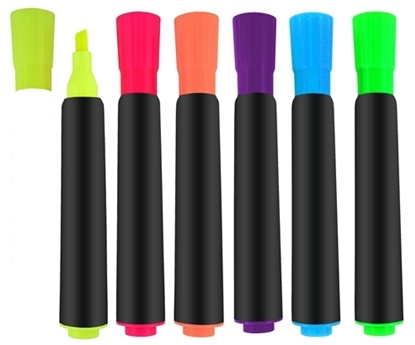 The Color Pop Highlighter has single color printing in an assortment of colors. Black barrel with color cap and accents. 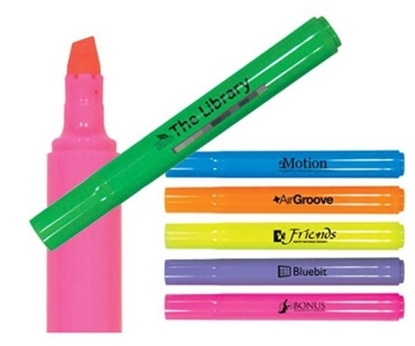 The Big Mark Highlighter has single color printing in an assortment of colors. Black barrel with color cap and accents. 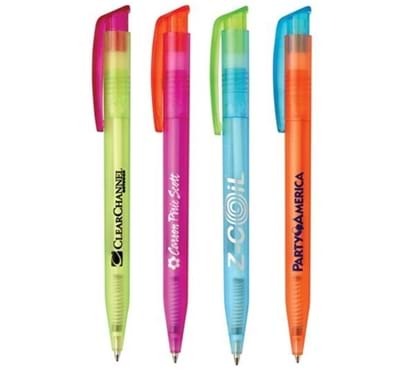 The ZigZag B Pen has single color printing in an assortment of colors. Unique design. Black barrel. Color accents. Pastel Blue - Retractable ballpoint pen with soft colors and a smooth feel. Perfect for those special occasions, weddings, summer events, breast cancer awareness programs, or anytime a subtle blush will make a big impression. The Bic Clic Stic is an always in stock item with a break-resistant pocket clip and over 400 possible color combinations available. One of our most popular retractables in promotional products! If you choose to do more than 1 imprint color, please notate the other colors in the order comments. 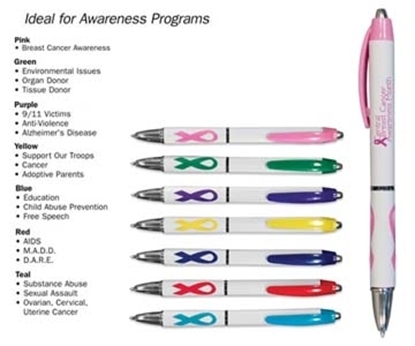 The awareness grip pen comes with a rubber ribbon grip that is great for awareness campaigns. 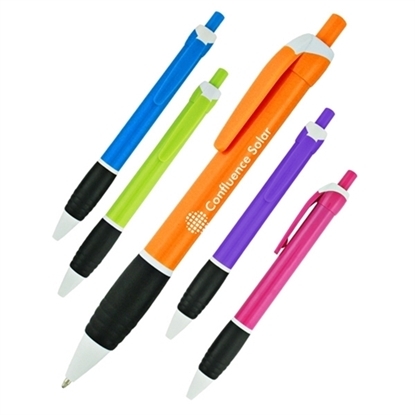 The clip matches ribbon grip color and the pen is available in 7 vibrant colors. 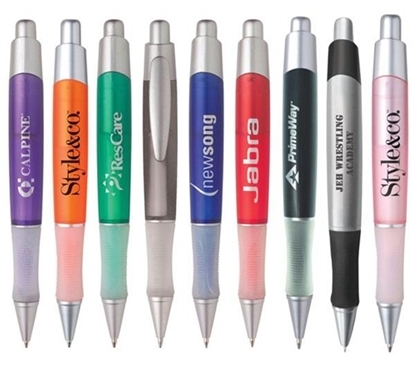 The Sleek Pen/Stylus has single color printing on an assortment of colors. These click action pens have metallic barrels. Pen point extends through stylus tip. 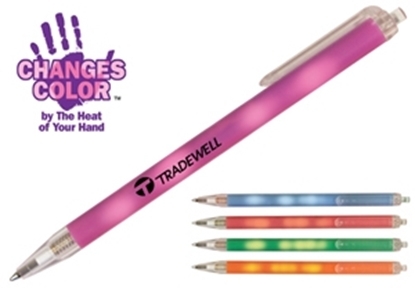 The Tornado Twist Pen is available in several matching trim color options and can be produced with a 1-color imprint or customized with 4-color process or up to 7 spot colors. 100% Made in USA! It's unique stylish design will provide a contemporary image to your logo or Ad message. Black trim accent 4 stock pen cap/barrel colors and a special Pink trim version is offered for fund raisers and health awareness causes. 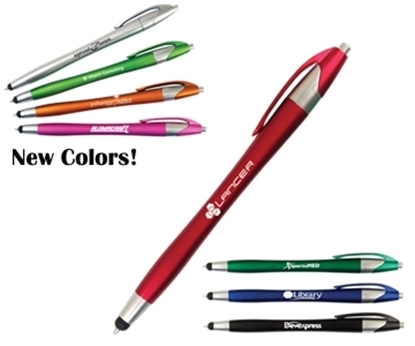 The Rio Click Pen has single color printing on an assortment of festive colors. 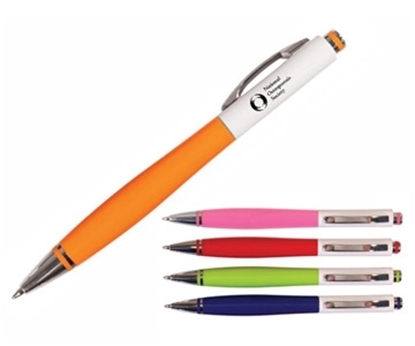 The Mood Sham Click Pen has single color printing in vibrant changing colors. 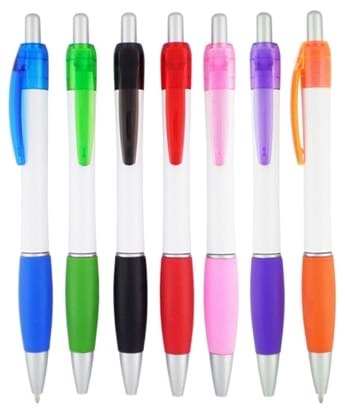 Quality retractable pens and clear trim. Screen imprint available. Sleek smooth body, squiggly clip and a smooth rubber grip makes the Astor a stylish, comfortable promotional pen at a discount price. Also available in Composition Notebook. Ribbed rubber grip. Retractable mechanism. 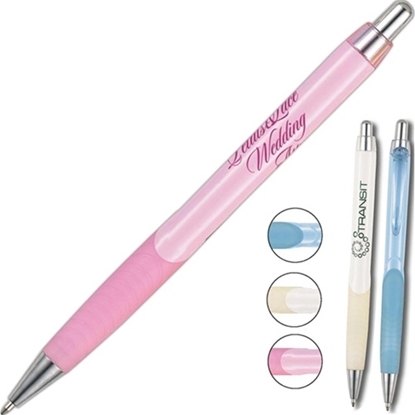 Mypromotionalpens.com offers the largest and best priced selection in Promotional Breast Cancer Awareness Pens. We will price compete and we won't be under sold. Let our graphic designers make your personalized Breast Cancer Awareness Pens standout above the crowd at no charge. We won't stop until you are completely satisfied with your custom Breast Cancer Awareness Pens art proof.Use category search filters on your left to help narrow your search to find exactly what you are looking for.